Having good health is as important to people with a learning disability as everyone else and for the majority of people with a learning disability most of their health needs are met by their GP or primary care team. However people with a learning disability may have additional health problems, such as certain medical conditions, sensory impairment and physical disability, difficulty understanding and communicating their health needs, accessing health services and activities that promote healthy lifestyles. Our Health and Wellbeing Co-ordinators support people with a learning disability to develop Person Centred Health Action Plans, access mainstream health services and develop healthier lifestyles. They also provide support to people with a learning disability and staff during hospital admissions, as well as preparation work with individuals prior to planned hospital admission, health screening and medical procedures to support with understanding and consent. Health and Wellbeing Co-ordinators also provide health promotion activities such as Health Walks, Men’s Health Group, Health Fun Days etc. Specialist Learning Disability Nurses provide advice, assessment, interventions and monitoring around the complex health needs of people with a learning disability. They offer support to individuals and their carers to enable self-management of health conditions. 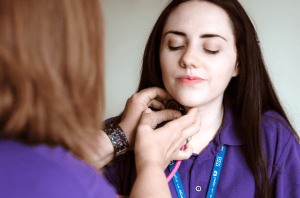 They also provide joint working to support mainstream health professionals and education and training for people with learning disability, their carers, mainstream health services, other health and social care professionals and learning disability providers. Our Learning Disability Physiotherapy Service provides advice, assessment and treatment to anyone with a learning disability who cannot access mainstream services. We offer advice on mobility issues, chest conditions and posture care and management of complex physical and learning disability needs. The service also provides health promotion activities, offering weekly groups for swimming, hydrotherapy, trampoline, walking and cycling. The Occupational Therapist supports people to reach their maximum level of function, independence and quality in daily life. This can include equipment and adaptations to the home environment, teaching skills required to live safely in the community, advice on posture management to promote comfort, function and health, help to increase social skills and to develop use and enjoyment of leisure time. Speech and Language Therapists provide advice, assessment, intervention, training and support regarding communication and eating, drinking, swallowing problems. They also lead on the use of Signalong and other communication systems for people with a learning disability. The aim of the service is to ensure carers of older people and people with a learning or physical disability have support to enable them to maintain their caring role. We try to reduce the impact of caring wherever possible and support the carer to have a life of their own, for example to participate in social activities, have access to peer support and where appropriate, a break from caring.